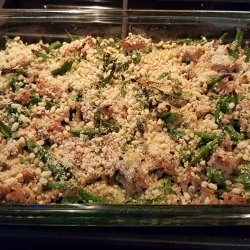 Back in the fall, I posted my gluten free, vegan green bean casserole recipe. It is always a big hit at parties and is super easy to make. This week, I was in a hurry to make a few meals, so I made sure this green bean casserole was on my list. I also wanted to make some meatballs for protein. Then I realized…why not just add the ground turkey right into the casserole to make things even easier?! I did brown the meat in a frying pan for about two minutes, and then I added it to the green beans. It was less than 10 minutes of prep time and baked in the oven for 35 minutes. Piece of cake meal! The best part was that it tasted awesome and we had tons of leftovers because I doubled the recipe. So, I highly recommend this as a nice, quick and easy dinner that can be made ahead of time if needed. Preheat your oven to 400 degrees. Make sure your rack is in the center of the oven. You should use an 8x12 baking dish or something similar in size. You will also need a frying pan greased with either a Tbsp of olive oil or cooking spray. While the oven is heating up, pour your frozen green beans into the large baking dish (yes, put them in frozen, no need to cook them or defrost them). Chop your onions into 1/2 inch pieces and sprinkle around the green beans, stirring if needed to mix them together thoroughly. Using your prepared frying pan, cook your ground meat until it is 75% cooked through. Try to brown it in the pan because it adds more flavor. You can use another Tablespoon of olive oil to help your meat cook properly. Season with the teaspoon of dried parsley. You don't want to cook it fully or it will get too dry in the oven. Once the meat is mostly cooked, pour it directly into the green bean pan. Try to include all the nice juices from the pan too! Stir it around so that it is evenly distributed. Drizzle the remaining 2 Tbsp of olive oil around the green bean pan. Add your non-dairy butter, breaking it into small pieces sprinkled throughout the top of the dish. Season with your remaining parsley and then use a spoon to distribute your bread crumbs across the top of the green beans and meat. Make sure to fill in the spaces and get a nice coating over the top. Bake it in the oven at 400 degrees for approximately 35 minutes, or until the breadcrumbs are starting to brown.